It’s been four years since we last heard any news on the Harley-Davidson LiveWire, but that’s all about to change by 2019. It was a typically beautiful day in the beachside town of Santa Monica. The sun was shining, the temperature mild and the popular Third Street Promenade was packed with shoppers. It was the quintessential SoCal postcard day, and it seems like it was just yesterday—only it was four years ago. In short, Harley’s LiveWire project sauntered up to the pool, made a big splash after a quick dive, then quietly receded back to its private cabana never to be heard or seen from again. Until now. Although no one knows what guise the planned 2019 LiveWire will have, the 2014 version cut a stylish line on the city streets. Although the basis for the e-moto world’s newfound basis of anticipation over the LiveWire actually going live was based solely on words spoken from company CEO Matthew Levatich in a conference call to investors, it was at least the first time we’ve heard anything definitive about the stylish bike from the historical house of the V-twin. And that, my friends, is the most that we know about Harley-Davidson’s planned re-entry into the modern world of battery-powered transportation. Still, if they really mean it, this could be a very bold step by the Motor Company to leap free from the sales doldrums it has endured of late as the classic Harley customer ages out, leaving a consumer base of kids who are not the least bit enamored with 600-pound, chromed-out touring bikes. Four years ago the streets of Santa Monica were as crowded with shoppers as they were with a parade of pre-production Harley-Davidson LiveWires. Around the same time that Harley went live with the LiveWire news, word also leaked that they have also filed a trademark application for the naming of the LiveWire powerplant, “HD Revelation,” which is a take on the Evolution motors used on their big bikes. For a bike that, as we later found, had no real production timeline, the 2014 LiveWire we rode was impressive with a definite ready for primetime finish. Although the bike was modeled with a dedicated seat cowl that prohibited passenger seating, the café bike styling was immediately appealing. Unlike the popular look of traditional Harleys with their exposed V-twin motors, the LiveWire’s powerplant was masked by plastic shrouds. Having owned two Harley Sportsters in my day, I had firsthand experience with traditional Harley traits of poor braking performance and saggy suspension, so I was heartened not only by the LiveWire’s braking performance, but the adjustable Showa suspension with an inverted fork was a welcome upgrade. At the time, the LiveWire prototype ran on a lithium-ion battery motor that produced 75 horsepower and 52 pound-feet of torque at its peak. The shrouded motor was mounted longitudinally in a cast perimeter frame and used a final belt drive. 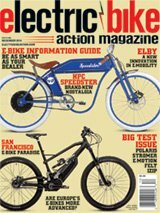 Just a few weeks after Levatich announced the revival of the LiveWire came the surprising news that Harley had also made an equity investment in Alta Motors, who, like fellow NorCal e-moto-maker Zero Motorcycles, has been attempting to catch some lasting interest in battery-powered motorcycles. Harley’s partnership with Alta mirrors the acquisition of Oregon e-moto-maker Brammo by big-brand Polaris who are also behind the successful relaunch of the Indian marque. Counter to the modern display module, the prototype bikes were still outfitted with the age-old switchgear and lever assemblies from an old Harley Sportster parts bin. Alta was no doubt more than pleased to be on the receiving end of Harley cash, as, like Harley, their evolution in the e-moto market has been defined by a somewhat fits-and-starts history. Although little is known just what the Harley/Alta partnership might produce in terms of shared product, old-time dirt bike stalwarts will recall that over four decades ago, in addition to their flat-track racing success, the Milwaukee factory won desert racing acclaim with their 100cc Baja two-stroke dirt bike. In 1975 early Harley factory rider Bruce Ogilvie made big news when he rode a prototype 250cc Harley-Davidson to win the Baja 500. A few years later, Harley would return to the same Italian-sourced engine builder (Aermacchi) to build the engines for some 250 and 370cc motocross bikes. These bikes enjoyed a very limited factory-backed racing effort and production run before Milwaukee abandoned the off-road world in 1979 once and for all. Based out of San Jose, California, Alta has been on track to release a production bike to the public for some time. Although they have gone through a variety of iterations, their current model, the Red Shift MXR, is said to feature a 50-horsepower powerplant with 42 pound-feet of torque with a rolling weight of 259 pounds. This bike, they claim, is now capable of running with a 350cc four-stroke motor, whereas the previous MX model was always compared to a 250cc powerplant. Alta adds that the recharge time has been reduced to just 1.5 hours on a 220-volt system. In addition to the motocross bike, Alta also produces Supermoto and off-road/enduro versions. The MX bike made a famously splashy debut in 2016 when former pro rider Josh Hill competed aboard a prototype at the 2016 Red Bull Straight Rhythm race. Notably, the company has refused our sister zine Motocross Action to test a bike in a non-Alta-controlled environment.